This is my second guest post at Tramping Philippines since I told my unfortunate & literal ups and downs in Mt. Batulao. This time, im posting with a music video that was shot near sea level, and not up there, where carrying yourself is hard enough, let alone a full-band setup. Yet carrying a full-band setup to the 5th floor of UST's Beato Angelico building wasn't easy either. That's what Dane, myself, and our band mates did to shoot one of our music videos. This one is special because the location is UST. That's where we all met, and its one of the most camera-ready locations in Manila. - At 400 years old, University of Santo Tomas, or UST is Philippines' oldest university. - That building with a huge cross on its tip is not a church. Now you know. I had to study there to know it. - Philippines' national hero, Dr. Jose Rizal studied in UST. He didn't like it. You know. Old-school issues. 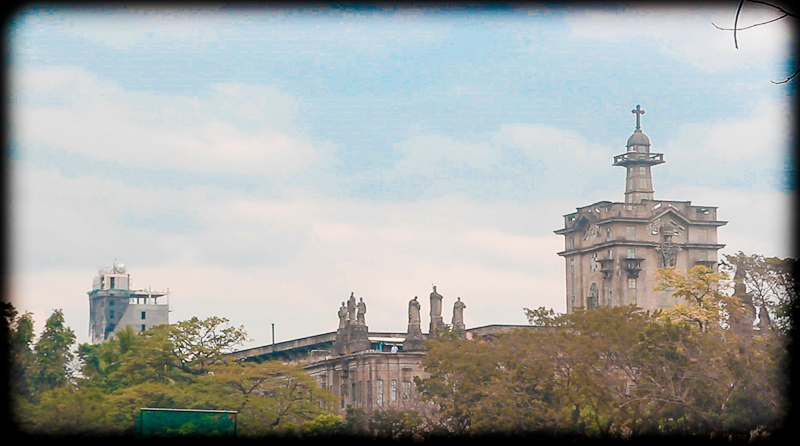 - UST is a university, church, and hospital in one. So living near UST is good for your body, soul, and brain. - However, it is also popular for being above-human deep when its flooding. - It is said that UST's Main Building was used as prison for Filipinos captured by Japanese forces during World War II. - Though surrounded by fast food restaurants, many students would still prefer Mang Toots at P Noval street any day.